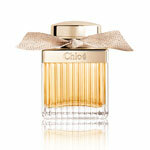 Chloé unveiled signature scent captures the creative, confident individuality of the Chloé woman. A fresh and feminine fragrance suited to a free spirit with an utterly innate sense of chic. The Chloe perfume is a combination of floral powdery notes, sprightly hints of peony and lychee and the embellishment of springtime freesia. The airy, flirtatious head notes drift away to reveal the richer and more sensual side of the rose, derived from the velvety interior of the flower. The rose is accompanied by heady magnolia and lily of the valley, as well as subtle intimations intimations of warm amber and elegant cedarwood. This complex yet intuitive blend effortlessly characterises the cool chic of the Chloé woman.